For the footballer, see Wayne Dyer (footballer). Wayne Walter Dyer (May 10, 1940 – August 29, 2015) was an American self-help author and a motivational speaker. His first book, Your Erroneous Zones (1976), is one of the best-selling books of all time, with an estimated 35 million copies sold to date. Dyer was born in Detroit, Michigan, to Melvin Lyle Dyer and Hazel Irene Vollick, and spent much of his first ten years in an orphanage on the east side of Detroit, after his father walked out on the family, leaving his mother to raise three small boys. After graduating from Denby High School, Dyer served in the United States Navy from 1958 to 1962. He received his Ed.D. degree in counseling from Wayne State University. His dissertation was titled Group Counseling Leadership Training in Counselor Education. Dyer, a Detroit native, worked as a high school guidance counselor there and as a professor of counseling psychology at St. John's University in New York City. He pursued an academic career, published in journals, and established a private therapy practice. His lectures at St. John's University, which focused on positive thinking and motivational speaking techniques, attracted many students. A literary agent persuaded Dyer to document his theories in his first book, called Your Erroneous Zones (1976). Dyer quit his teaching job and began a publicity tour of the United States, doggedly pursuing bookstore appearances and media interviews ("out of the back of his station wagon", according to Michael Korda, making the best-seller lists "before book publishers even noticed what was happening"). After Your Erroneous Zones dozens more books followed, many of them also best-sellers. Among them were Wishes Fulfilled, Excuses Begone and The Sky’s the Limit. The success of these books eventually led to national television talk show appearances including The Merv Griffin Show, The Tonight Show, and The Phil Donahue Show. Dyer proceeded to build on his success with lecture tours, a series of audiotapes, PBS programs, and regular publication of new books. Dyer's message resonated with many in the New Thought Movement and beyond. He often recounted anecdotes from his family life and repeatedly used his own life experience as an example. His self-made man success story was a part of his appeal. Dyer told readers to pursue self actualization, calling reliance on the self a guide to "religious" experience, and suggested that readers emulate Jesus Christ, whom he termed both an example of a self-actualized person and a "preacher of self-reliance". Dyer criticized societal focus on guilt, which he saw as an unhealthy immobilization in the present due to actions taken in the past. He encouraged readers to see how parents, institutions, and even they, themselves, had imposed guilt trips upon themselves. Although Dyer initially resisted the spiritual tag, by the 1990s he had altered his message to include more components of spirituality when he wrote the book Real Magic and discussed higher consciousness in the book Your Sacred Self. Wayne Dyer stated Nisargadatta Maharaj to be his Teacher and cited the quotation, "Love says: 'I am everything'. Wisdom says: 'I am nothing' from a compilation of talks on Shiva Advaita (Nondualism) philosophy I Am That. He was influenced by Abraham Maslow's concept of self-actualization and by the teachings of Swami Muktananda, whom he considered to be his Master. In his book, Wishes Fulfilled; Mastering the Art of Manifesting, Dr. Dyer also credited Saint Francis of Assisi and the Chinese philosopher Lao Tzu as foundational influences in his work. Pulling Your Own Strings. (Copyright 1978) This was Dyers' 2nd work published as sole author. It developed the idea of habitual "belief systems" hampering our personal effectiveness. Chapter 7 "Never Place Loyalty to Institutions and Things Above Loyalty to Yourself" listed "Strategies for eliminating institutional victimisation". Psychologist Albert Ellis wrote that Dyer's book Your Erroneous Zones was probably "the worst example" of plagiarism of Ellis' Rational Emotive Therapy (RET). In a 1985 letter to Dyer, Ellis claimed that Dyer had participated in an Ellis workshop on RET before he published Your Erroneous Zones, in which Dyer appeared to understand RET very well. Ellis added that "300 or more people have voluntarily told me... that [the book] was clearly derived from RET." Dyer never apologized nor expressed any sense of wrongdoing. Ellis admonished Dyer for unethically and unprofessionally failing to credit Ellis's work as the book's primary source, but expressed overall gratitude for Dyer's work, writing: "Your Erroneous Zones is a good book, ... it has helped a great number of people, and ... it outlines the main principles of RET quite well,... with great simplicity and clarity." In the book Your Erroneous Zones, Dyer makes reference to Albert Ellis in chapter seven. In 2010, writer Stephen Mitchell filed a lawsuit against Dyer and his publisher, Hay House, for copyright infringement for taking 200 lines, without permission, from his version of the Tao Te Ching for his books Living the Wisdom of the Tao and Change Your Thoughts – Change Your Life. The suit was dismissed in 2011 after Dyer and Mitchell agreed to a settlement. My beliefs are that the truth is a truth until you organize it, and then it becomes a lie. I don't think that Jesus was teaching Christianity, Jesus was teaching kindness, love, concern, and peace. What I tell people is don't be Christian, be Christ-like. Don't be Buddhist, be Buddha-like. Religion is orthodoxy, rules and historical scriptures maintained by people over long periods of time. Generally people are raised to obey the customs and practices of that religion without question. These are customs and expectations from outside the person and do not fit my definition of spiritual. Dyer died from a heart attack, said his publicist, Lindsay McGinty on Maui, Hawaii on August 29, 2015, at age 75. He had been diagnosed with leukemia in 2009. At the end of his life span, he wrote a quote for the book wonder. "When given the choice between being right or kind, choose being kind." Day & Night (2010), an animated short film created by Pixar, featuring an excerpt from one of Dyer's lectures and voiced by Dyer, which was shown with Toy Story 3 (2010) during the latter movie's opening in the U.S.
^ Comfort, David (November 14, 2013). An Insider's Guide to Publishing. Writer's Digest Books. p. 244. ISBN 9781599637815. Archived from the original on January 14, 2018. Retrieved September 30, 2017. ^ "Author Biography". Hay House. ^ Wayne, Dyer. Group Counseling Leadership Training in Counselor Education. ProQuest. Retrieved July 25, 2014. ^ a b c "Wayne Dyer, author of 'Erroneous Zones', dies at 75". Spokesman. September 1, 2015. ^ Michael Korda (2001). Making the List: A Cultural History of the American Bestseller, 1900–1999. Barnes & Noble Publishing. ^ Dan P. McAdams (2006). The Redemptive Self: Stories Americans Live by. Oxford University Press. ^ Henlee Huxlee Barnette (1982). Exploring Medical Ethics. Mercer University Press. ^ "Local News". Boca Raton News. November 13, 2002. ^ "Interview With New Age Retailer". November 2005. Retrieved December 23, 2014. ^ YouTube. YouTube. May 16, 2014. Retrieved June 6, 2015. ^ Dyer, Wayne. Wishes Fulfilled, Mastering the Art of Manifesting. ^ Ellis, Albert (2010). All out! : An Autobiography. Amherst, N.Y.: Prometheus Books. p. 485. ISBN 9781591024521. ^ Ellis, Albert (2010). All out! : An Autobiography. Amherst, N.Y.: Prometheus Books. pp. 486–490. ISBN 9781591024521. ^ Dyer, Wayne W. (2012). "DVD no. 1 of 4-DVD set: Experiencing the Miraculous". Archived from the original on January 27, 2012. ^ "Health & Wellness Articles - Anti Aging - Fitness - Detoxification - Inspiration - Mental Health - Nutrition - Medicine - Relationships - Weight Loss - Success - Anti Aging". Retrieved June 6, 2015. ^ "There's A Spiritual Solution To Every Problem". Archived from the original on December 4, 2013. Retrieved June 6, 2015. ^ Aiello, McKenna (August 30, 2015). "Wayne Dyer Dead at 75—Ellen DeGeneres, Portia de Rossi and More Stars Remember Self-Help Guru". E! Online News. Retrieved August 31, 2015. ^ Johnson, M. Alex (August 30, 2015). "Self-Help Pioneer Dr. Wayne Dyer Dies at 75, Family and Publisher Say". NBCNews.com. Retrieved August 31, 2015. ^ Hearne, Geri (August 16, 2016). 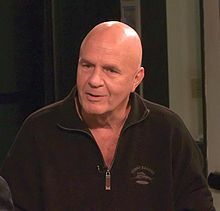 "Dads Never Die: In Death, Wayne Dyer Teaches His Children And Us About Love". The Huffington Post. Retrieved September 4, 2016. ^ "Day & Night: The Quote". Pixar Talk. Retrieved June 6, 2015. This page is based on the Wikipedia article Wayne Dyer; it is used under the Creative Commons Attribution-ShareAlike 3.0 Unported License (CC-BY-SA). You may redistribute it, verbatim or modified, providing that you comply with the terms of the CC-BY-SA.